Just Romantic Suspense: Why Make Them Suffer? Hello again. It’s always a pleasure to drop over and visit with you at Just Romantic Suspense. 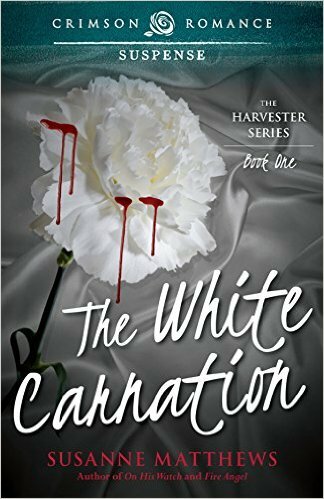 Comment on the post for your chance to win one of two digital copies of The White Carnation, Book One of The Harvester Series. 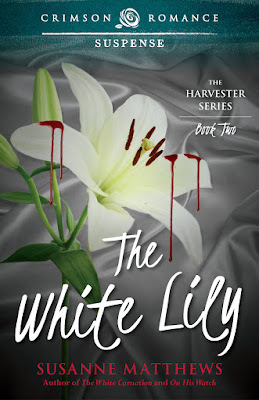 Today, I’d like to introduce you to my latest romance/suspense novel, The White Lily, Book Two, in the Harvester Trilogy. A friend who reads all of my work asked me the other day why I made my heroines suffer. The question made me think, and I realized that yes, I do torture and abuse my heroines. I wouldn’t wish what happened to Alexis in FireAngel, Misty in In Plain Sight, Nikki in On His Watch, Olivia in All For Love, Michelle in Echoes of the Past, Faye in The White Carnation and now Lilith in The White Lily on anyone, and yet, why do I do it? For effect. By nature, a suspense novel has to have the main characters facing danger—someone or something has to be out to get them, and the situation has to be dire enough to get the reader’s heart pumping and make them keep turning the pages. Think of it this way. If there is a massive accident in the opposite lane on a divided highway, why does traffic on your side slow to a crawl? Because people want to see. They are curious. I believe suspense readers want to be kept on the edge of their seats wondering what’s going to happen next. Novels aren’t reality. Many of the stories, like the movies and television programs we watch, the ones that grip our attention, are larger than life, and sometimes, like in movies, we need to take a little literary license with what we do to our characters. Grisly murders, gory torture scenes, life and death situations build tension. But whatever happens has to do so for a reason—it has to advance the plot. In The White Lily, both Lilith, my leading lady, and Jacob, the hero, have endured torture and it is that common element that serves as a stepping stone into a potential relationship. They’ve also suffered personal loss, another kind of torture that helps them bond, grow, and heal. I won’t stop torturing my characters anytime soon. Apologies to them all, but no matter what trials and tribulations they endure, they all end up with a happily ever after! And isn’t that what we’re all searching for? FBI cult specialist Lilith Munroe lives in dread that one day the man who tortured her when a case went bad will find her again. So leaving her sanctuary in Quantico to join the Harvester Task Force in Boston is her version of hell. But the Harvester is kidnapping babies, and Lilith’s profiling skills may mean the difference between life and death for the most innocent in society. Susanne will be giving away e-copies of THE WHITE LILY to two people leaving a comment or email entry. Giveaway ends 11:59pm EST Oct. 27th. Please supply your email in the post. You may use spaces or full text for security. (ex. jsmith at gmail dot com) If you do not wish to supply your email, or have trouble posting, please email maureen@justromanticsuspense.com with a subject title of JRS GIVEAWAY to be entered in the current giveaway. See the JRS SHOWCASE for more giveaways! I love suspense novels... that bit of danger... the characters overcoming obstacles to find a happy ending. I agree, you have to put the leads through hell when writing suspense. It's more exciting and rachets up the tension. Congratulations, Susanne. Nice tie in with title & covers.